It’s said that there are variations of Hollywood films in every country around the world. If that’s true, newly released Australian comedy Ruben Guthrie is no doubt the equivalent of 2013’s modern classic The Wolf of Wall Street. 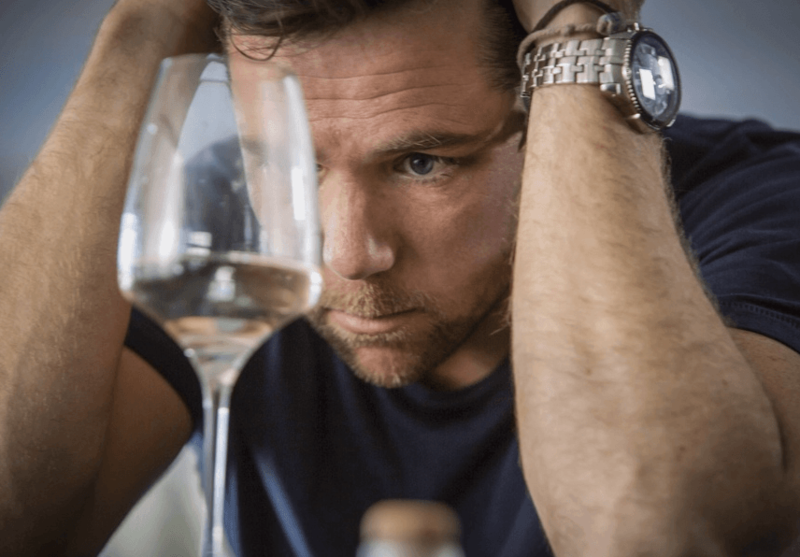 The story centers on Ruben Guthrie (Patrick Brammall), an advertising star living the life, partying and drinking in his Sydney mansion whose world comes crashing down when his model fiancé Zoya (Abbey Lee) leaves him and promises to return if he agrees to give up drinking for a full year. Ruben starts reluctantly attending Alcoholics Anonymous and tries to remove alcohol from his life. It places a strain on his job, with his boss asserting that alcohol is necessary for him to come up with another award winning ad. His parents (Jack Thompson and Robyn Nevin) are proud alcohol drinkers who believe the poison is a strong part of who Ruben is. And in an effort to stay social, his gay best friend Damian (Alex Dimitriades) stays with him and tries to get him back on the drink. From the outset, Ruben Guthrie is positioned to be a comedy about the struggles of an upper class man trying to stop himself from drinking and how he reevaluates his life. But as the story goes on, the plot turns into an analysis of Australia’s drinking culture and the integration of alcohol into most social situations. Moving from a coming-of-age story to an exploration of excessive alcohol consumption among friendships and family in Australia, Ruben Guthrie works as a crowd pleaser. However, many aspects of the production falter. The screenplay is filled with clichés and questionable dialogue with occasional dark humour and affecting drama. Cowell’s writing is focused and seems accurate, but lacks sympathy for the film to work. Sadly, the female characters are not as well developed as the male ones and most of the characters are presented more as caricatures. Probably the most strange thing about the film is the immense use of product placement. Though using and referencing real life products enhances the believability of the film, it feels too exploitative and advertorial like to enjoy it. I wouldn’t be surprised if some of these products paid to have their products and services featured in the film – but then again, that’s what Ruben Guthrie would do. Originally published on OuttaGum, 8 May, 2015.